After researching a little bit, messing around with system defaults, less to my surprise, I found out that Apple has disabled Subpixel antialiasing for text in macOS Mojave. It’s gone. This is easily my best work ever. Check out why I worked ridiculously hard for 1.5 years and a 1,000+ hours building, recording, sharing 200+ dev tips in this VSCode.pro course! ⚠️ Using FALSE/NO is the same since it’s a boolean data type. This will lead to the font smoothing to be enabled — especially for non-retina external monitors. You’ll thank me later. You need to sign out and sign back in or restart your Mac before you can see your changes after running this command. That’s pretty much all. 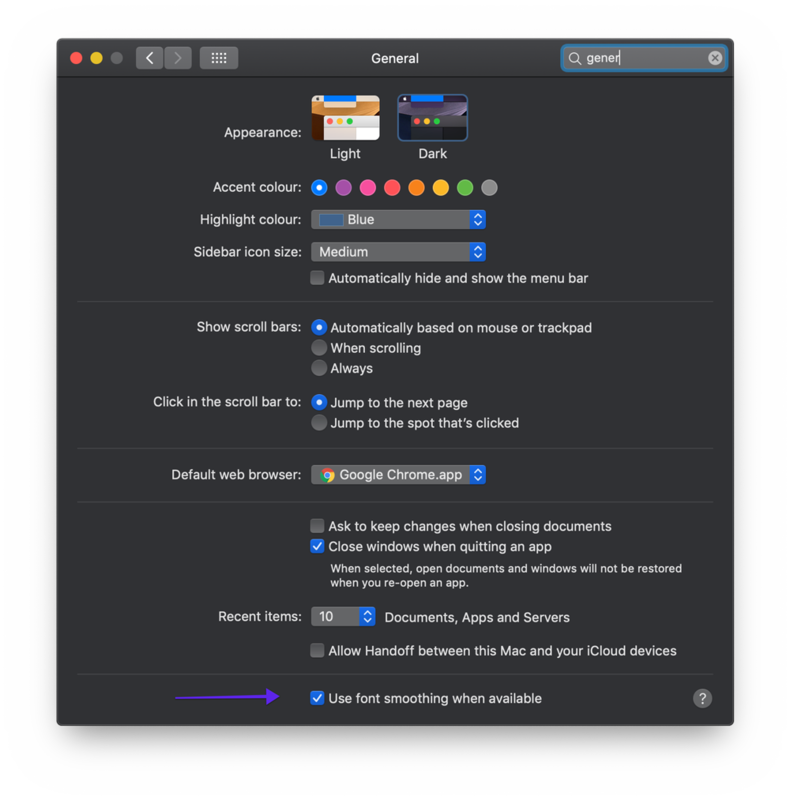 🎯 Apple’s macOS normally has a set of defaults that you can change programmatically. I have such an opinionated workflow for whenever I install my OS from scratch. That’s a story for another day. 🤔 I was unable to find that setting in macOS Mojave defaults. I kept looking in there. Especially in the Apple Global Domain settings, since that’s where the old setting was. 🙃 Aha! I found a new setting in there, it’s called CGFontRenderingFontSmoothingDisabled — it’s quite evident what this setting does. Disables the rendering of smooth fonts. It was set to 1 which means it was set to TRUE or YES. ⚠️ Some folks also recommended enabling the font smoothing option in the General font settings but that didn’t work for me. It was already enabled and did nothing to improve the situation.